We had some big changes this year... new place, new jobs, new chapter in life. I feel like it was just yesterday when I had my new year's plans, and then the move and suddenly it's time to bid adieu to the new year and get ready for the next one. But before the new year ends, the last post is for the two events hosted by two of my favorite bloggers. 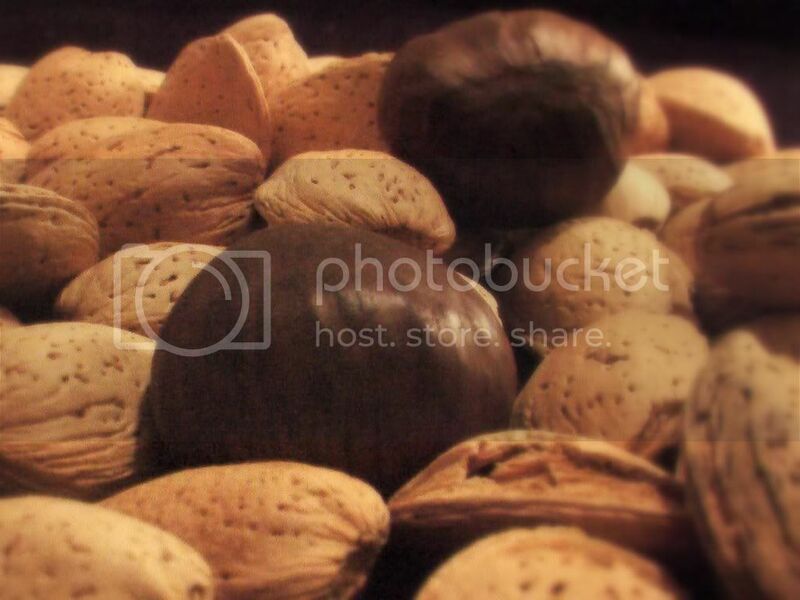 Click is hosted by Jai and Bee at Jugalbandi and the theme for December is Nuts. 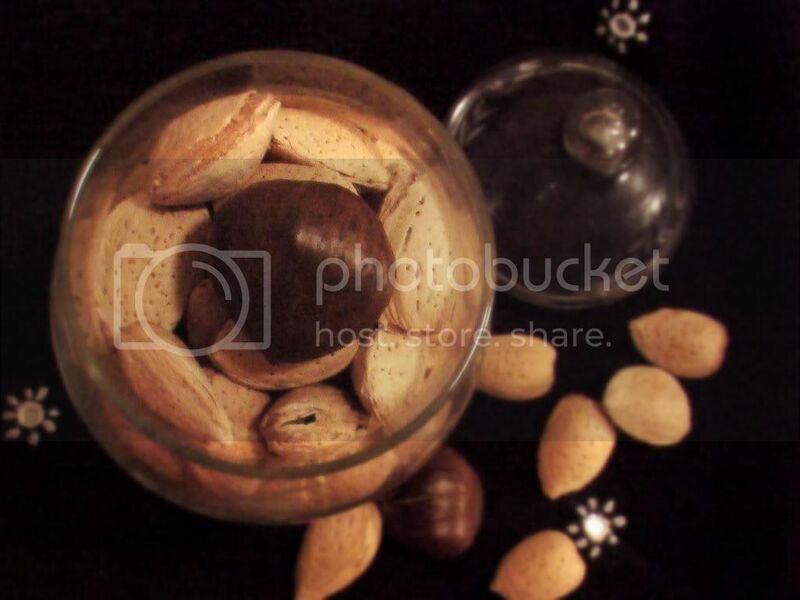 We had some delicious roasted almonds and chestnuts as part of the end of the year celebration thanks to the event :) This is my entry to the event. Nupur of One Hot Stove is hosting Best of 2007. And this is the perfect time to look back and see all the things I wanted to do - learn new recipes, experiment with some to come up with my own, make some healthy choices and really at the end of the day, serve healthy and nutritious food. 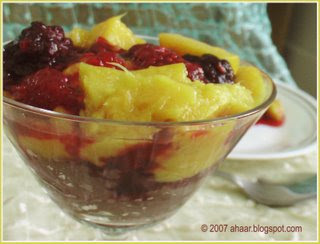 It is so hard to choose from the recipes and posts for my favorites. 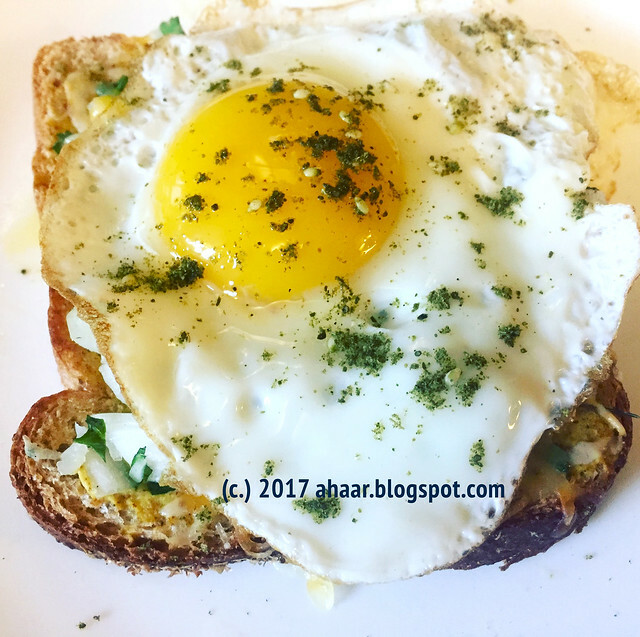 Looking back, I thought each recipe, event and dish gave me something new - a new taste, a new recipe, a new grain, a new flavor, above all, something delicious. In no particular order, here are some of the recipes and moments from last year. 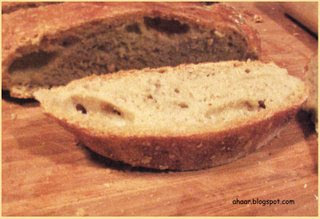 Home Baked Bread - You probably know how much I wanted to bake my own bread. And I finally did it when I baked the No Knead Bread. 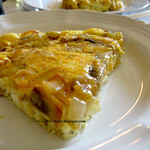 With the crunchy outer crust and the softness inside, it had given me the inspiration to keep baking. So lookout for new breads this year! 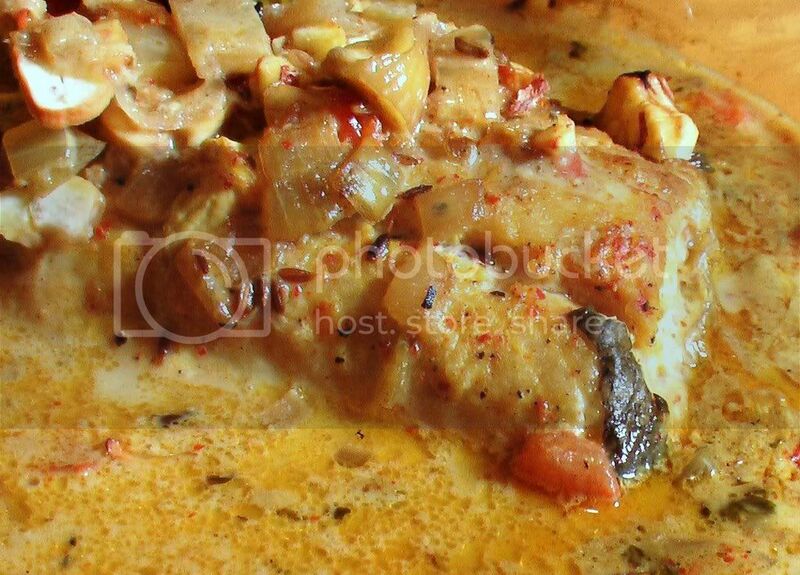 Enchorer Dalna (Jackfruit Curry) - I celebrated the blog anniversary with the taste of Jackfruit curry, a taste I have not had in many years. This curry took me back to the childhood days when we visited grandparents every summer and had endless Mango and Jackfruit eating sessions. Now that I have rediscovered it, I am bound to make more of such recipes. Spicy Beetroot Soup - I like soups and I am always trying to make something that is quick, wholesome and nutritious. This was one of them. This year I also tried Thai Soup with Tofu, Roasted Sweet Potato Soup and Slow Cooker Black Bean Soup. I already have a list of soups that I want to try next year. 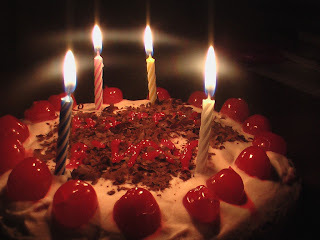 Black Forest Cake - I baked one of our favorite cakes this year for Aswin's birthday. I have one word for this - indulgence! 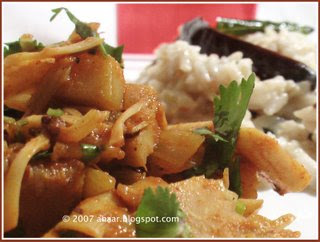 Indonesian Trout Curry with Chestnuts - I end the year as I started 2007 with a new recipe and a new flavor. This Indonesian curry with the creaminess of coconut milk, the chestnuts and the smoothness of the fish gave me a new appreciation for trying out new recipes. I am hoping to continue the same next year. Everyone has aspirations for the new year. For my kitchen and for us we want to do more of the same. Hopefully we will continue to make simple quick dinners and lunches, indulging our tastes, learning new recipes and making healthy food. WONDERFUL AND EXCITING NEW YEAR. When we were in Buffalo visiting friends a couple of months ago, one of our friends made this delicious chicken kabob. 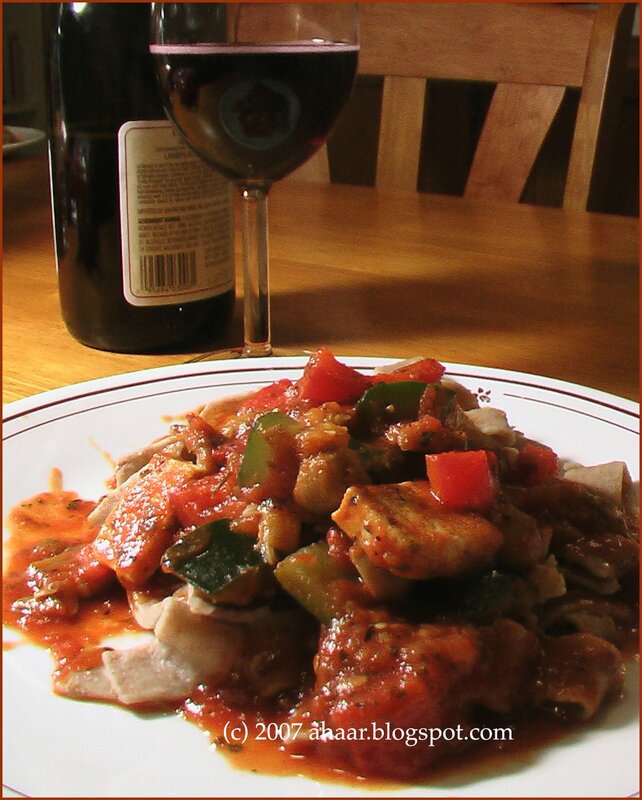 It took about 20 minutes to cook and tasted delicious as an appetizer with wine and even went well with dinner. I had been thinking about the recipe for a while and decided to make it for our little celebration for the Christmas Eve. I used the chicken from the Farmer's Market to try out the kabob, so it had a mix of boneless and boned pieces. After marinating it for a couple of hours, we put it in the oven. 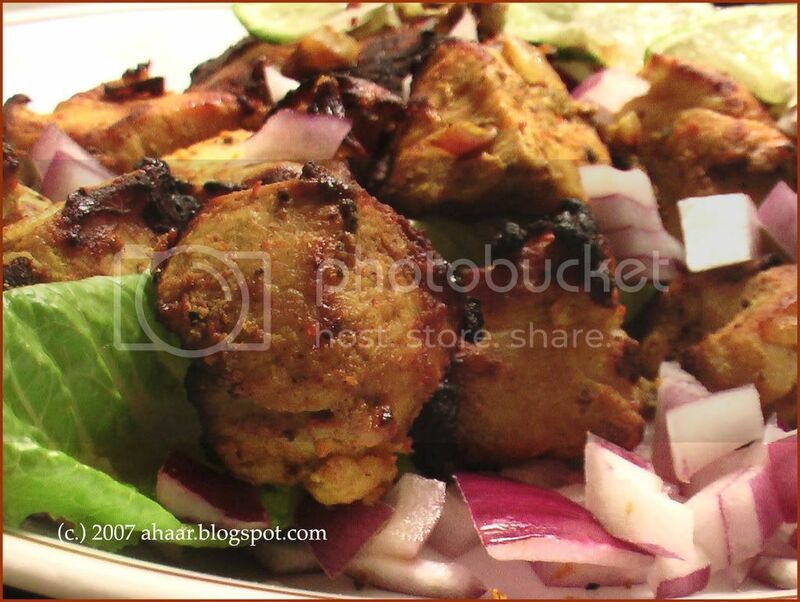 I tried my broiler for the first time, and it worked out like a charm, just like the malai kabobs. 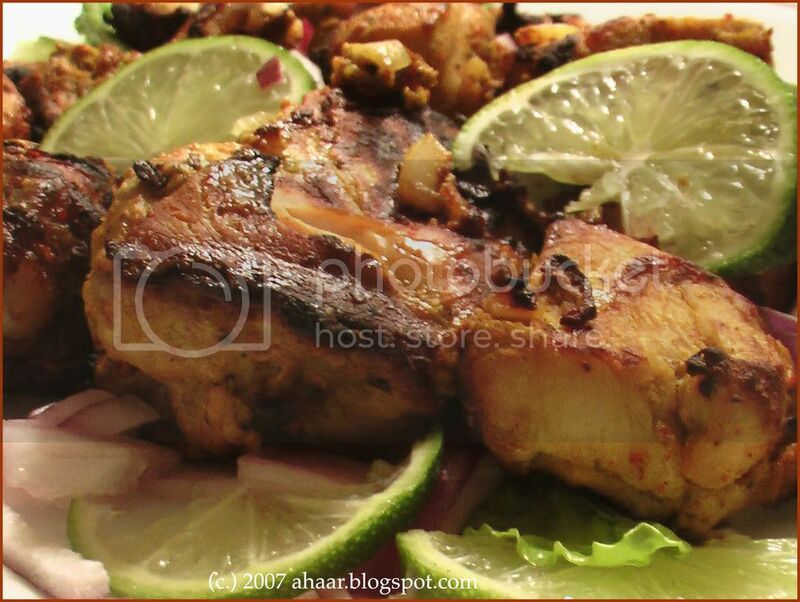 Make the marinade by combining salt, yogurt, ginger-garlic paste, lime juice, garam masala, turmeric powder, coriander powder and red chilli powder in a medium bowl. Mix well. Add chicken pieces to the marinate and coat well. Let it marinate overnight in the refrigerator. If not atleast marinate it for a couple of hours. Heat the oven to broil and then put the chicken in for 20 minutes. 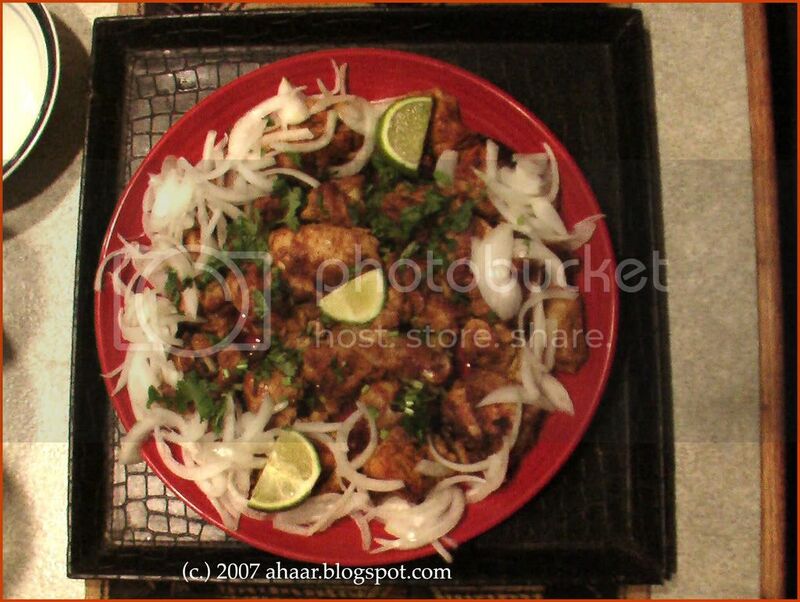 At the 10 minute interval, take the tray out and turn the chicken pieces. Check on the chicken often to ensure it's not overcooked or undercooked. Serve with lime, onions and cilantro. FELLOW BLOGGERS, FRIENDS & FAMILY. We knew that a snow storm was heading our way, there had been abundant warning about that. What we didn't expect was that we would get a foot of snow. In the evening, when the snow was finally tapering down, we went out and cleaned our car. And tried driving around, but gave up after 15 min of driving and skidding on the road at 10 mph. Instead we headed back home for a warm fish curry. We got a nice long Trout fillet from Whole Foods recently and I instantly knew that we had to make something special with that. I looked around for a different recipe. I came across this recipe which sounded delicious. So I adapted it to our tastes adding a tomato, and some more spices. Also I baked the fish curry instead of cooking it on stove top. Let me tell you how it tasted. 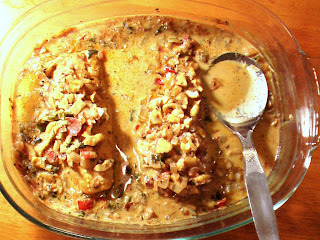 It had the spicy notes mixed with the smooth coconut milk, the meatiness of the chestnuts complimenting the soft fish. In all it was one delicious curry which we enjoyed with rice. Roast the chestnuts in the oven at 250 deg F for 20 minutes. Make a 'X' on the chestnuts so that the steam can escape. Let it cool and then chop it roughly. Marinate the Trout fillet with turmeric powder and salt for a couple of hours. Heat 1 tspoon oil in pan and lightly saute the fillet on each side. Set it aside. Heat the rest of the oil and temper it with cumin seeds, fenugreek seeds and dried red chilli. Then add the ginger and garlic and saute for 2-3 minutes. Then add the sliced onions and saute till then turn translucent. Add the tomatoes and mix well. Make a paste of all the powder spices and add it to the pan. Add the coconut milk and mix well. Take it off the heat and set aside. 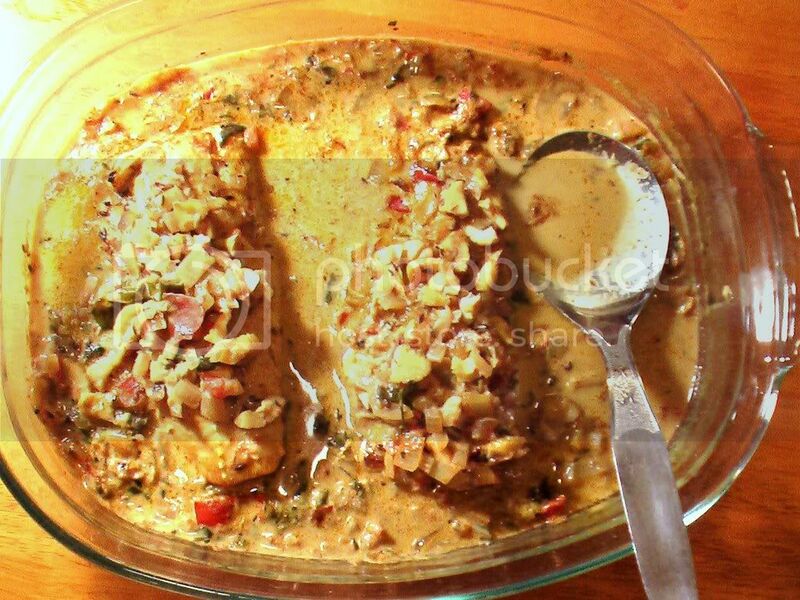 Place the trout fillets in a baking dish and then pour the coconut and spices on the dish. Add the chestnuts on top of the fillet. Bake it at 300 deg F for 30-35 min till the fish is completely cooked. This is going to Grindless Gravies hosted by Sra at When My Soup Came Alive. 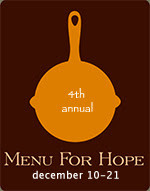 In case you haven't heard as yet, Menu for Hope-4 is going on at Chez Pim. 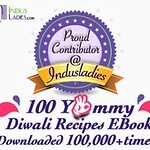 I am offering two interesting books for prizes this year. One of them is a limited edition facsimile (bound as a book) of first by an African American published in 1866. The other one is a guide to parmesan cheese by Ari Weinzweig (founder of Zingermans). Menu for Hope -4, an annual fundraising event hosted by Pim Techamuanvivit on her blog Chez Pim, kicks off Monday morning. Five years ago, the first Menu for Hope was born after the devastating tsunami in Southeast Asia. Since then, the campaign has become a yearly affair, raising funds to support worthy causes worldwide. Food Bloggers from around the world offer prizes for raffle tickets. The money raised goes to the UN World Food Program, so be generous to the worthy cause, and you may just win a prize! Check Chez Pim early Monday morning to see all the prizes and get more details about how you can participate. And check out Kalyn's Kitchen for all the prizes offered by the Midwest bloggers. And the site for donation - First Giving, that Pim set up is secure and safe and accepts major credit cards. I donated using the site last year and it was easy and quick. Like Indira so aptly said: Cynicism is fine but compassion rocks! I am offering two prizes this year. UC 08 - Facsimile Copy of only known of cookbook by the first African American published in the 19th century. Limited edition facsimile of this historic cookbook authored by an African-American in 1866 is now available. This is a full color reproduction of the only known copy of Domestic Cook Book by Malinda Russell, edited by Jan Longone. It includes recipes for a delicate rose cake, elegant catfish fricassee and sweet onion custard among others. Read about the book and Jan Longone's search for Malinda Russell here. Founder of Zingermans (regularly voted as one of the best food organizations in the US if not in the world) writes this delightful book. The journey from the green can cheese to the real Parmigiano-Reggiano deal has led Ari all over Italy and deep into libraries. This book combines history, journalism, and recipes to paint a fascinating portrait on real parmesan that's great for novices and experts alike. Even though I have been really busy this past week, I couldn't miss JFI:Toor Dal hosted by lovely Linda of Out of the Garden. A dear friend and a fellow Michigander at heart, she has a collection of amazing pictures of Michigan. I am looking forward to exploring and discovering Michigan with abundant help from her. So I present to you Spicy Toor Dal Fry. 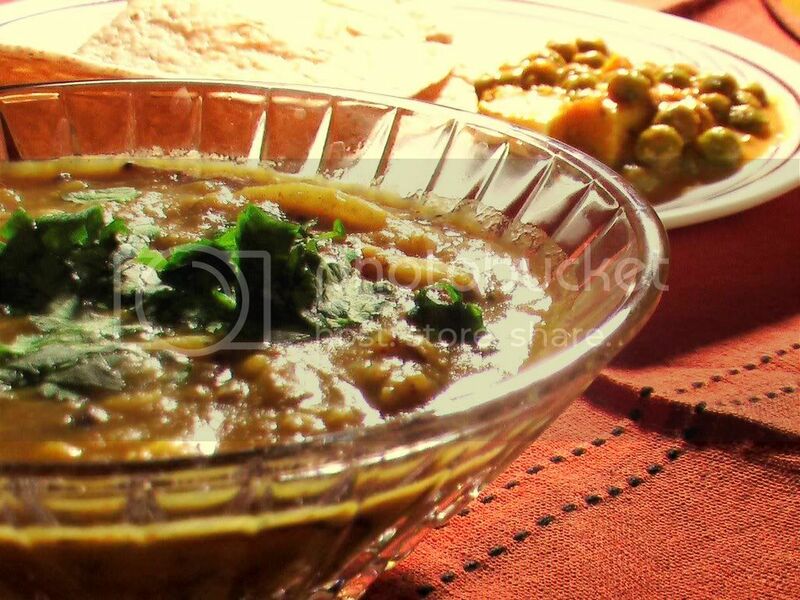 You could probably make dal fry using a combination of dals as well. 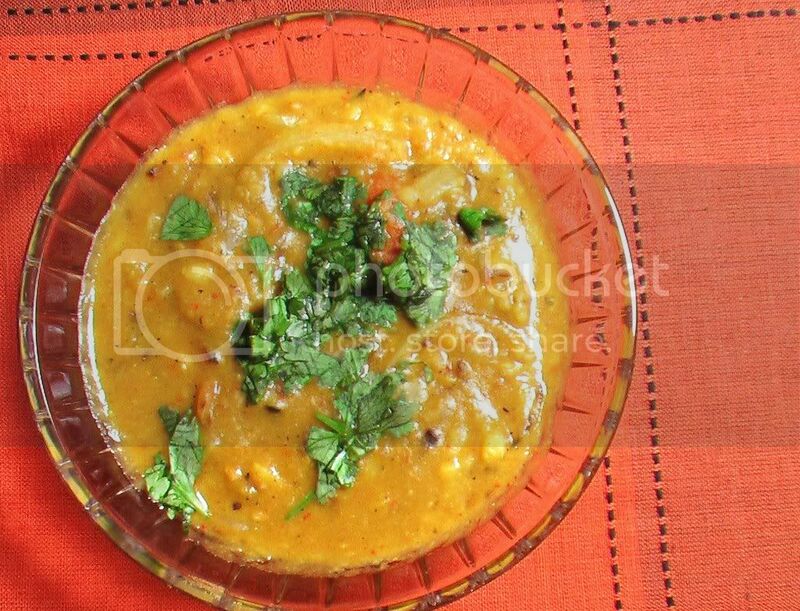 Dal Fry is another dish that I remember from my various road trips in India, specifically Uttar Pradesh. We would stop by a roadside dhaba and order some dal fry, sabzi and rotis. Almost always, the dal fry was spicy and delicious. Also taking a cue from the dhaba experience, I didn't grind my ginger and garlic, rather I cut them in small, thin slices. Biting into cooked garlic and ginger pieces gives an intense flavor to delight, but not intense to overwhelm. Boil the toor dal till it's completely cooked. Set it aside. tomatoes and cook on closed lid till it turns soft. and mix it well together. Add 1 cup water or more as needed. 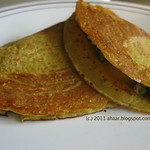 roti and matar paneer. 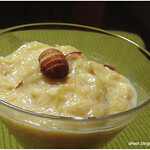 This is our entry for JFI: Toor Dal. Around 6 o' clock last evening, just as the first snow storm of the season began sweeping across southeast Michigan, we were driving back from a matinee show of the Madhuri Dixit comeback, Aaja Nachle. We stopped at a Trader Joe's on the way and decided to make an evening of it - a nice bottle of Lambrusco, button mushrooms, red bell peppers, zucchini, tofu, a bottle of sphagetti sauce, and organic sprouted wheat pasta (pappardelle). And we picked up some dark chocolate as well! The whole meal takes no more than 30-40 minutes. In one vessel, boil the pasta. And as that is getting done, chop up the vegetables and tofu. Saute the tofu for 8-10 minutes (both sides) and set it aside. Add rosemary, sage, and thyme to olive oil. 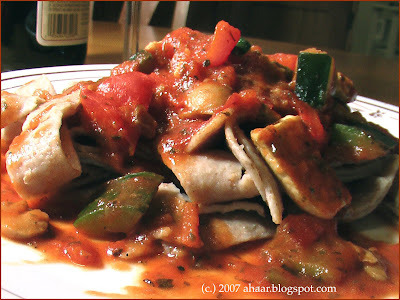 To this, add the zucchini and red bell pepper and let them cook for about 5 minutes. Then add the mushrooms and cook for another 4-5 minutes. Now add spaghetti sauce and let the whole mixture cook for 6-8 minutes. Make sure it isn't too soft (al dente, as they say). Drain the pasta and spoon the sauce onto the pasta. And don't forget the dark chocolate!